J is at the very bottom of the "near colorless" range. Normally, we would recommend that engagement ring shoppers don't go below H. But you can find GREAT value in a J colored diamond. 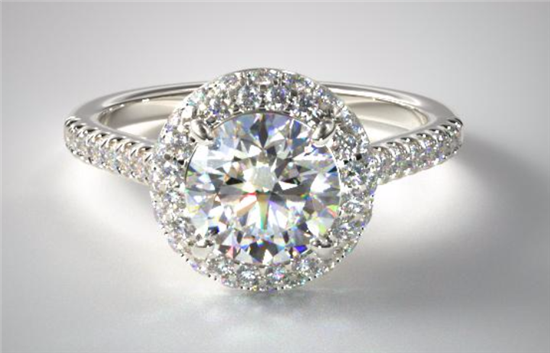 With prices as much as 25% less than an H colored diamond, J is a good option to consider for those on a budget. Let's dive into our detailed guide for shopping for a J diamond (with real life examples from James Allen). Will a J Diamond Look Yellow? In our opinion, there is a slightly noticeable yellow tint. But it's debatable. Honestly, this really depends on a variety of factors: how color sensitive you are, what shape the diamond is, if there are adjacent diamonds for comparison, etc. (And of course, if you know the diamond is a J, and are looking for color.) We'll go over all the factors to consider. Some people can see a slight yellow tint in J colored diamonds, while others think they face-up perfectly white. Keep in mind that color does NOT affect the sparkle of a diamond. Cut is the main factor that will determine how brilliant the diamond appears. And if a diamond has fierce sparkle and reflects a lot of white light, it will help mask color. So if you're choosing a diamond in the J color range, it's extremely important to get the best cut possible. 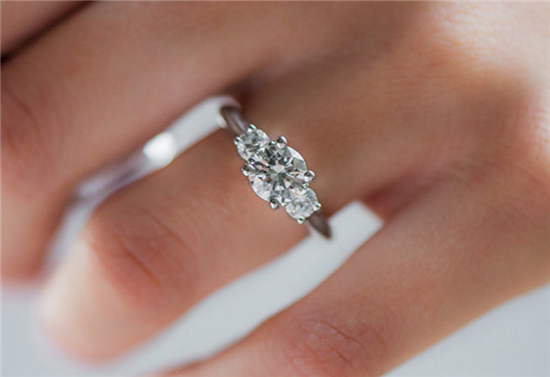 If you're considering a J-diamond engagement ring, you must check out reputable online retailers like Blue Nile and James Allen. Keep in mind: The larger the diamond is, the more it absorbs color. Diamonds smaller than 0.75-carat will most likely look fine with a J. But if the diamond is well over 1 carat, we'd recommend that J is not a good choice (unless it's in a yellow gold setting, which we'll go over next). 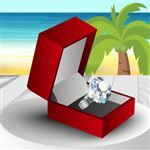 Shop for J color diamonds at James Allen, a CreditDonkey #1 recommended partner for the best place to buy an engagement ring online. The color of the band all comes down to personal taste. And if your girl prefers a yellow gold or rose gold band, then you're in luck! Because this means you can go down in diamond color and it'll still look beautiful. And you'll save a ton too. A diamond will naturally pick up the color of its surroundings (in this case, the band). So if you're setting it in a yellow gold band, even the most colorless, iciest of diamonds will take on a warmer, yellowish tint. It'll be a waste shelling out dough for a whiter diamond. 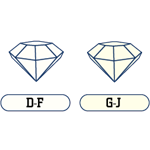 Both of the diamonds in in the above example are the color J. But see how different they look when set into different colored bands? The one set in platinum has a noticeable yellow tint. And the one set in yellow gold complements the band well and looks way whiter. If you're setting the diamond in yellow or rose gold, you can safely drop to a J or K.
And if you're setting it in a platinum or white gold band, we're not discouraging anyone from considering a J. If you aren't too color sensitive or prefer a warmer look, then go for it! Just remember to get the best cut possible. Where is the Best Place to Buy J Diamond Engagement Ring? If you're on a pretty tight budget, this is one of our favorite money-saving tips. Look for a diamond lower in color grade with fluorescence. Fluorescence is when a diamond shows a soft glow under ultraviolet light (usually blue). This is caused by certain minerals in the diamond. This effect is totally natural, appearing in a third of all diamonds. Usually, fluorescence causes no negative visible effects on the appearance of a diamond. Except for diamonds high in color (D-G), a strong fluorescence can cause a hazy look. BUT in diamonds with lower color grades (I and lower), fluorescence can actually improve the color! The blue counteracts the slight yellow tint and improves the face-up color. Usually, it can appear one color grade whiter. To take advantage of this, look for a J colored diamond with a medium to strong fluorescence. Note: Usually a strong fluorescence doesn't have a hazy effect on diamonds lower in color. However, if you are unsure or don't feel confident, then it's best to see the diamond in person. Or if you're ordering online, get it looked at by a trusted rep. This is something important to consider that gets overlooked a lot. If you plan on getting a setting with side stones (such as in the picture below), it's extremely important to match the colors of the center stone and the side stones. When you have diamonds set right next to each other, then it is a lot easier to notice if a diamond looks more yellow than its neighbor. And you especially do NOT want the center diamond to be the yellower one. For example, for the setting above, James Allen specifies that the average color of the side stones are G-H. In this case, either you want to upgrade your center diamond to H, or you can get in touch with a rep and ask to match the side stones to I/J. Note: This is only true for large side stones, such as those used in the three-stone setting. If you have small diamonds in a pavé band, then it doesn't matter as much. Another potential setting to beware of is the Halo. For example, the halo in this setting has an average color of F-G (colorless to very nearly colorless). A J center diamond may appear slightly yellow when surrounded by whiter diamonds. Different diamond shapes hold color differently. We recommend that you only consider J color for the round brilliant cut. The round cut gives off the most brilliance and thus can hide the most color. Fancy cut diamonds tend to reveal color easier. In this example, you can see how color will appear in a round, emerald, and pear shaped diamond. All these diamonds have a color of J. Step cuts, like emerald and asscher, have a large open table that allows you to look deep into the body of the diamond. You can easily see any color. We recommend no less than an H.
Shapes with pointed tips, such as pear and marquise, will trap color at the tips. In the example above, you can see how much more yellow the tip of the pear-shaped diamond appears. We also recommend no less than an H.
Get the best cut possible, because a good cut does a great job at masking color. Yellow gold bands complement a J diamond very well. But don't be discouraged from white gold or platinum either. Look for a J diamond with a medium-strong fluorescence to improve the face-up color. Fancy shapes will appear more yellow than a round brilliant. A J colored diamond is great value if you're on a tight budget. In our opinion, it does have a slightly more detectable yellow tint. But if you don't have another diamond to compare against or aren't too color sensitive, there's also a good chance you may not notice. Keep in mind that it'll appear more yellow in a white gold or platinum band. And it's even more important to get the best cut possible.